Good performance for a startlingly low price make this drive a game-changer for bargain users. But it's a dud when it runs out of cache. 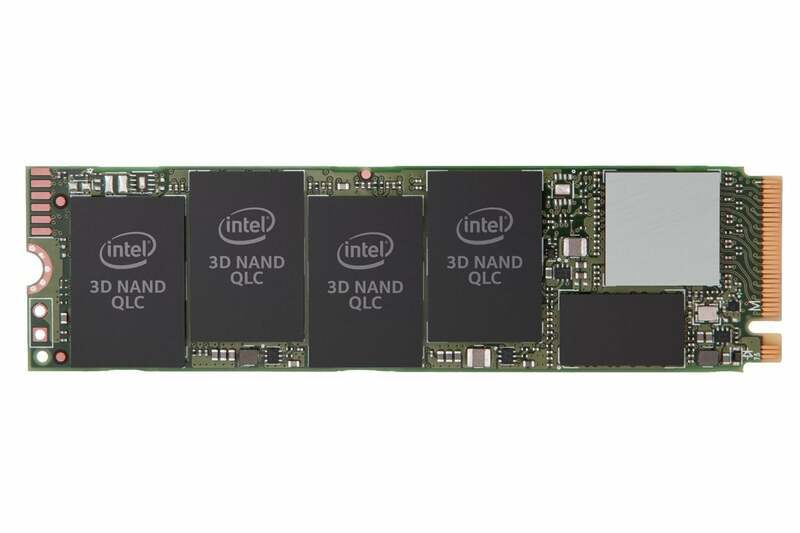 Intel’s SSD 660p is a bit of shock to the system. 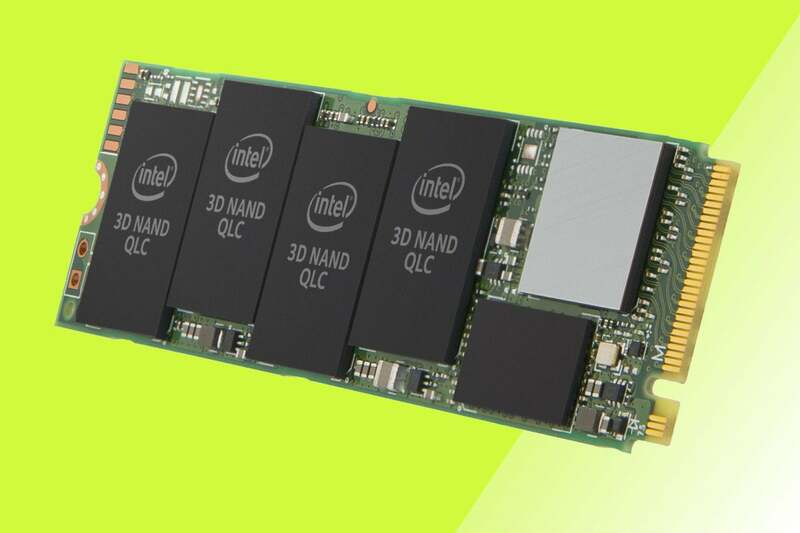 Not only is this NVMe drive the first Quad-Level Cell (QLC/4-bit) SSD on the market, which portends larger-capacity offerings, it’s faster during everyday use, and far cheaper—$200 for 1TB—than even the most affordable TLC offerings. And thanks to some cache trickery, it can sustain speed through a decent-sized write. But while life just became more difficult for vendors working the low end of the NVMe SSD market, purveyors of top-end drives needn’t worry. When the 660p runs out of cache, write speed plummets to the speed of a slow hard drive. That’s an issue. How much of an issue depends on how you’ll use the drive. Intel sent us the 1TB version of the M.2 2280, PCIe x4/NVMe 660p. There was no label or heat sink, which served to call attention to what is a surprisingly sparsely populated PC board. There are only two memory chips on one side, and what’s likely a DRAM chip under a metal cover. From the images Intel sent us, it appears the company can easily fit four chips on each side, so expect 2TB and possibly 4TB models in the near future. As of now, there’s only our 1TB version and a $99 512GB version. Note that the latter is significantly slower, which I’ll talk about below. Note that this is a 2TB drive, though Intel hasn’t announced it and we have the 1TB unit with only two NAND chips. Fill the other side, and you’re talking about a 4TB, M.2 2280 NVMe SSD. The memory is 64-layer QLC, that is, Quad-Level Cell NAND. QLC means that each cell can store four bits of information, compared to Triple-Level Cell’s three (TLC), Multi-Level Cell’s two (MLC), and Single-Level Cell’s one (SLC). While the drive itself performed quite well during normal testing, this was because of caching techniques. Intel was quite candid about QLC being slower than their TLC when written natively. Note that the 1TB 660p is very thin and light, which is nice when you want upgrade your laptop, assuming your laptop has a M.2/PCIe NVMe slot, and supports booting from NVMe. Note that the slot will need at least four PCIe lanes to take full advantage of the 660p’s full performance. The 660p has static DRAM and SLC caches, but it owes its sustained performance to a variable-sized secondary SLC cache. How do you vary the size of the cache? You use a portion of the main body of QLC and treat it as SLC by writing only one bit, which is a whole lot faster than writing the full four bits. The 660p dynamically assigns more QLC to be treated as SLC when need be, and when time allows, transfer its contents to QLC writing the full four bits. At least that’s what I took away from the presentation. 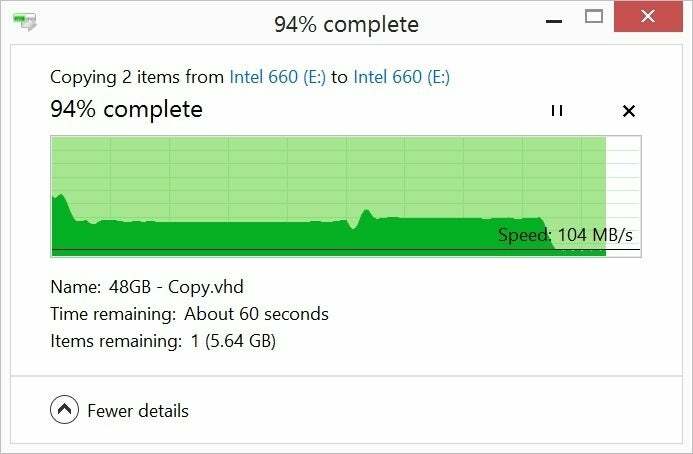 The Intel SSD 660p’s performance (gold bars) isn’t close to that of the fastest NVMe SSD we’ve tested, but it is fast during normal use compared to low-end TLC drives. Of course, you wouldn’t guess it from our AS SSD 2.0 results, which showed stupefyingly low 200MBps sequential (large file) reading. Yes, reading, not writing. That’s something I’ve never seen from an SSD or the test before. Ever. As this weird result wasn’t corroborated by the real-world results or other synthetic benchmarks, ignore it. Intel informed me that with its own Rapid Storage drivers this doesn’t happen. We stuck with the integrated Windows 8.1 drivers used in our other testing. Why the bizarre read score in AS SSD, we can’t say, but it didn’t correspond to real life performance. Intel says it’s RST (Rapid Storage Technology) drivers eliminates this aberration. CrystalDiskMark’s results, shown below, were in this particular case, far closer to the reality. There’s a sensible sequential read result, though it’s hardly what you see from top-end drives such as the Samsung 970 Pro. Random numbers show how quickly the drive can find and serve up small files, while sequential shows large file performance. CrystalDiskMark 6 rates the Intel 660p well above the average bargain drive such as the Toshiba RC100, but it can’t compete with the Samsung 970 EVO or Pro. Then again, the 660p is considerably cheaper than either and still has good seek times. Our 48GB copy tests, which simulate copying large files such as movies, and a group of smaller files and folders as you might move during an uncompressed backup, confirmed CrystalDiskMark’s opinion, and my subjective experience. I’d have no qualms whatsoever about putting this drive in my system for everyday use. The Intel did quite well in our 48GB copy tests. Tthe 970 EVO drops off the pace with the single file write because it runs out of cache before the transfer is complete. The 660p will run out of cache as well, just not as quickly. 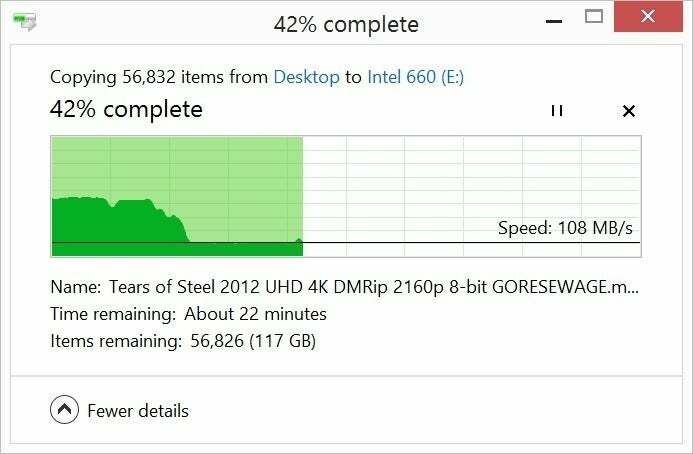 Note, that these are the results for a 1TB drive. Intel quotes significantly slower results in the sequential write and random read scores for the 512GB version—in fact, about half. That’s because there’s only a single chip on the 512GB drive rather than two. In effect, you’ve halved the pipes available to shotgun data. When the 660p runs out of cache, it writes little faster than a hard drive. 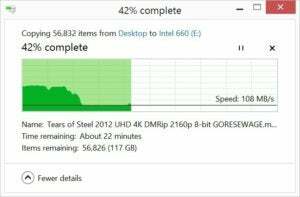 The copy is from a SATA SSD, which is limited to 450MBps, yet the 660p still couldn’t come close to keeping up. You shouldn’t see this very often, if ever, but it is disheartening when you do. My impression from Intel’s discussion and white paper, was that the drive should perform well during long transfers until it’s close to being filled. But I was into only my second internal (from the 660p to the 660p) copy of 96GB when write speed plummeted to 95MBps - 100MBps. After the first occurrence, speeds dropped far sooner. Giving the drive time to do housekeeping—that is, move the cache contents to QLC—did help. But it took a while and won’t help you if you need to write a lot of data. The only other drives to record write speeds this slow were the Toshiba TL100 and TR200, and those were 2.5-inch TLC SATA SSDs. The slowest writes I’ve seen out of a NVMe SSD when it runs out of cache were from the Toshiba RC100, but those were still a livable 400MBps. 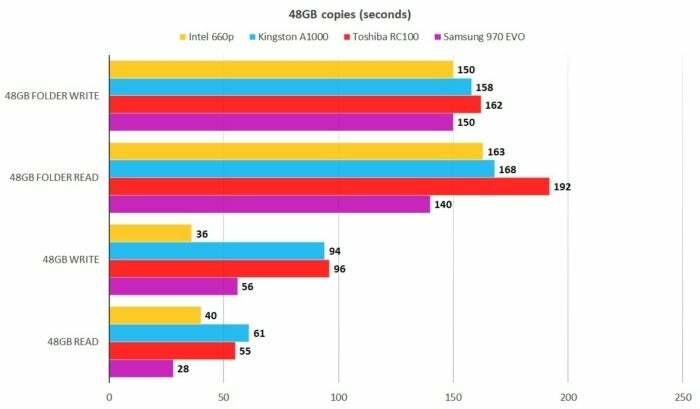 The Kingston A1000 shown in the charts isn’t nearly as fast as the 660p on cache, but off it, its writes dropped only to around 800MBps - 900MBps. This slowdown occurred after approximately 80GB had been copied, but subsequently, with the less free space (still over 600GB), the drops happened far sooner during copies. I gave Toshiba a hard time, so I have to give Intel the same. 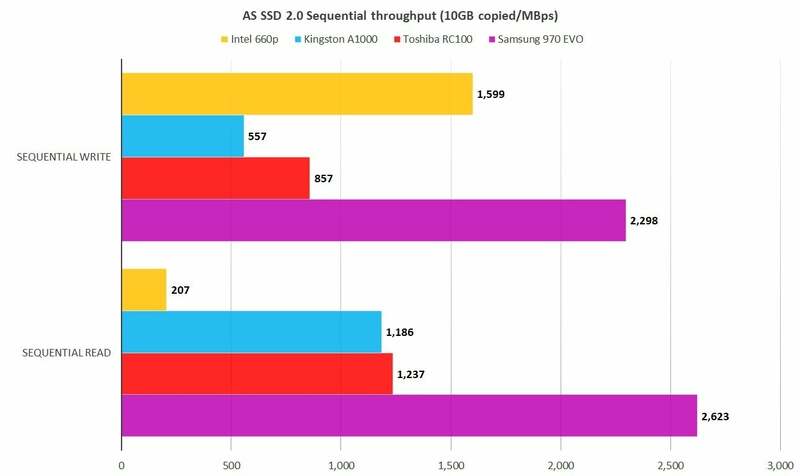 It’s a bit shocking to see slower-than-hard-drive write performance from any SSD, but doubly so with an NVMe SSD. To be fair, Toshiba’s drives go in the tank after writing any file that’s more than 1.5 percent of total capacity, while the 660P poops out at more like 4 or 5 percent—enough to cover all but really major operations. Still, when it does tank, it’s a bit depressing to watch. At the end of our normal testing, I was all set to anoint the 660p the best of the bargain NVMe SSDs, as well as a danger to its faster competitors because of its ridiculously low price. Then I saw writes plummet to 100MBps, and my simple conclusion went out the window. The truth is, most users will never see that 100MBps write speed, and while on cache, the 660p is quite a bit faster than any other budget NVMe SSD we’ve tested. Because of that, I still consider it a bargain and a boon for the budget shopper. Just be aware that there's a reason the drive is so inexpensive. Because of that, drives such as the Kingston A1000, which was $220 (less than half what it was when we reviewed it) for 960GB as of this writing, are still in the conversation.